I was alerted by @iancapstick last Friday that voting records for Canada’s MPs are now available on the Parliamentary Website. Here’s the G&M story about it that he tweeted. Nice that this has been made available. 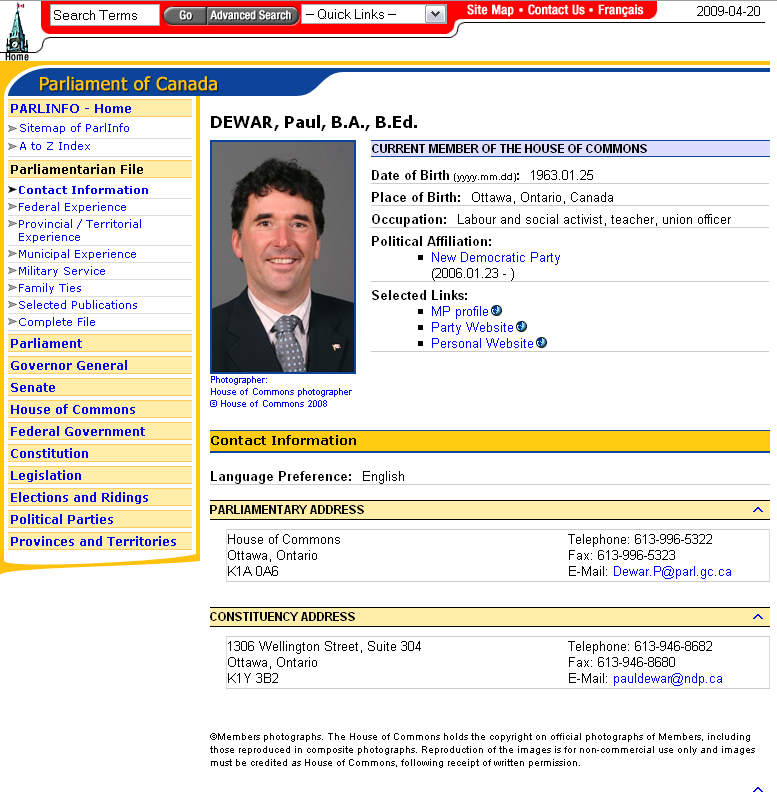 Yesterday, I decided to check it out for myself, so I hopped on over to www.parl.gc.ca – Front and centre on the main page there’s a box for me to enter my postal code to find my MP – so that’s what I did found myself on the page for my local MP. But no voting record. To view an MP’s record, head to the website and click on the ‘Senators and Members’ link to find your member of the House of Commons. Your MP’s site will list whether they voted yea, nea, or didn’t vote at all on any given bill. Ahh, I was looking in the wrong place. Following this procedure, I was able to get to the right page showing my MP’s voting history. But the question remains – why on earth are there separate listings like that? What’s the point? Resulted for me in a very disruptive experience. And then there’s the whole issue of the data itself – it is available via XML, but no API or similar method. I tweeted this on Friday also, and @gordonbonnar responded with: “Most of our parl related stuff is not that accessible programattically unfortunately. I wish we had a CA equiv to opencongress.” Indeed. It’s about time, but what a lame execution… It’s time for some civic-minded Canadian hackers to slurp out all that data and reformat in a way that gives you real insight into what your elected representative is up to and how she compares to all the other politicos on the Hill. Update: Here’s a couple of sites that scrape data on Parliamentary votes and represent it in interesting ways: How’d They Vote? has been indexing Hansard since 2005, while Our Parliament is more recent and pulls data from a variety of points.